Close to the Hub Trail! Come and view this centrally located 5 year old executive bungalow. Over 2600 square feet of usable living space, this 3 plus one bedroom, 3 bathroom home has everything you are looking for. Open concept kitchen, great for entertaining, large dining and living area offers a spacious vibe. The large master bedroom has an ensuite and generous sized walk in closet. The two other bedrooms are very roomy and each have their own closets. The second bathroom on the main floor is as modern as it comes with a large ceramic tile shower with plenty of room. The spacious lower level has a recroom/ living room area as well as a third bathroom with double sinks, laundry room and large 4th bedroom as well as a seasonal storage room. Plenty of space and storage in this beauty. Gas forced heat, central air, air exchanger etc. The outdoor deck is great for entertaining your friends and family. Corner lot which offers plenty of real estate. 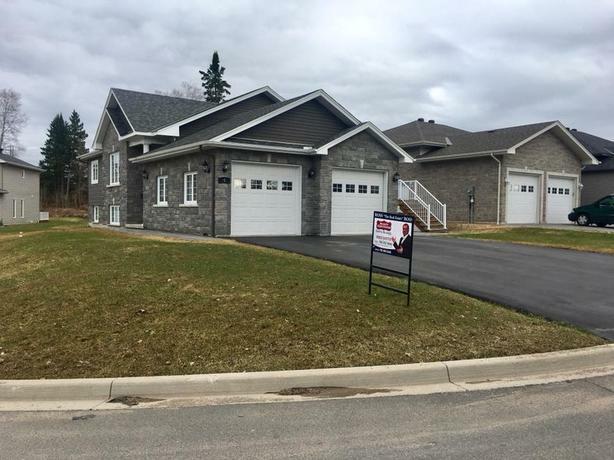 Stone brick, Asphalt triple car driveway and double garage complete this turn key bungalow.